Successful people tend to plan their day, working long hours, and they never give up. Can you see the problem? In our list, we have three different types of grammar structure: an infinitive (to plan), a gerund (working), and a full clause (they never give up). This is the opposite of parallelism! To improve this list, we need to change everything to the SAME FORM. And that means making sure that everything matches the FIRST ITEM in the list. Successful people tend to plan their day, work long hours, and never give up. I am really looking forward to spending time with my family, eating fish and chips, and watching British TV when I go home later this year. This is because carbon dioxide helps to trap the heat in the atmosphere and making the earth’s temperature rise at a great rate. This is because carbon dioxide helps to trap the heat in the atmosphere and makes the earth’s temperature rise at a great rate. 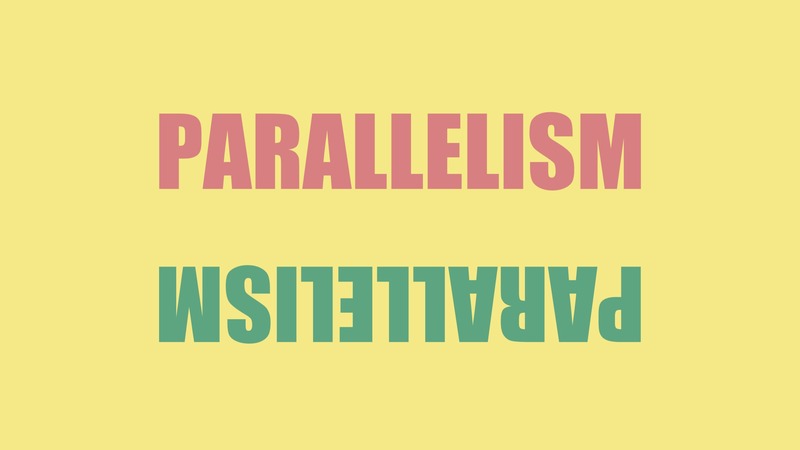 There are also more complex structures that use parallelism. These are called “paired conjunctions” and this is when we use TWO WORDS to join clauses. And, guess what? Those clauses must have the SAME FORM! both / and I ate both the chicken and the fish. either / or Students often drop out of university because they are either stressed or burned-out. neither / nor Multi-national companies neither generate jobs nor pay a fair wage, so they have definitely not improved people’s quality of life. not only / but also The government should introduce a carbon tax not only to reduce the current consumption of fossil fuels but also to encourage future industry to move to alternative sources of energy. You can find out more about paired conjunctions in my free Introduction to Complex Sentences lesson. But, all you need to remember from today’s lesson is that paired conjunctions must always join words of the same form. First of all, pursuing a career they are genuinely interested in would make students more satisfied and lower tension, as the chances to lose interest or getting into bad habits is lower. As large and industrial cities already suffer from poor air quality because of traffic fumes and air is contaminated with carbon emissions. Factories emit toxic gases into the air, which destroys the ozone layer and also causing air pollution. Before being ready for sale, the final set of stages include a quality check, packaging and storage of the product. How did you get on? Here are the correct answers. Notice how sometimes we have to change quite a lot of the sentence to get the parallelism correct. As large and industrial cities already suffer from poor air quality because of traffic fumes and carbon emissions. Factories emit toxic gases into the air, which destroys the ozone layer and also causes air pollution. Before being ready for sale, the final set of stages include checking for quality, packaging and storing the product.